Michael O’Neal is originally from Ohio. He lived there for 12 years, then they moved to Philadelphia, where he became a Steelers fan, was very active in sports and got into a lot of mischief. In high school, his parents decided to move to a little redneck town – Spring Hill, Florida. He hated it, and after graduation, immediately moved back to Philly. He traveled around some, graduating from music school in Palm Beach, and got his undergrad at Temple University in Philly. His concentration was communication, and focused largely on a new thing called the “Internet”, in 1994. Michael worked as a web designer for 15 years. Though he still does some design and development, it’s only under duress. He moved to Boulder, Colorado in 1997, staying in that region until 2012, when he moved to San Diego. Between 2004 and 2008, both of his parents became ill and his life fell apart, with both of them passing away in 2007 – 7 months apart. Despite his best efforts, he was faltering, and decided he needed to take the time to mourn, so took his parents’ ashes, put them in a little parmesan cheese shaker and left a little of them everywhere – all over Europe. In the Sistene Chapel, the Beaches of Normandy, Notre Dame and more. When he came back to the U.S., Michael discovered internet marketing. In 2013, he started a podcast called “The Solopreneur Hour – Job Security for the Unemployable”. The podcast was an immediate hit and has a unique tone, focusing on solopreneurs vs. entrepreneurs. There IS a difference. Michael’s been featured on Smart Passive Income with Pat Flynn, The Art of Charm, Chris Ducker, in Inc. Magazine and PR News, just to name a few. 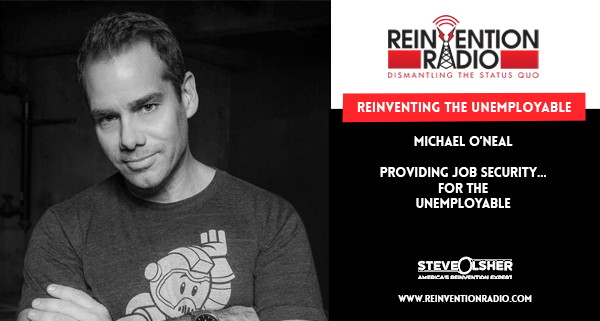 TUNE IN to this episode as Michael chats with Steve, Mary, and Richard about solopreneurs and providing job security for the unemployable. Reinventing Podcast Guesting – In this episode, Nicole Holland chats with Steve, Mary, and Richard about finding your dream clients on podcasts that your ideal clients and customers are tuning in to.